Hockey is a sport of tradition; some odd, some brilliant, but all important. There is no other sport where flying fists are a necessity, or where a player scoring three goals dictates that fans should throw their hats onto the playing surface, “only in Canada”, as Grandma Rigby would say. Among the many trends that permeate this sport, there has been one missing over the past 20 years or so, an absence that has undoubtedly damaged our great game. Luckily, it has recently had somewhat of a revival, and this has sparked a great excitement around the league. I speak of course of thecoup de grâce of facial hair, the thing that separates men from boys ... the moustache. This has always been an integral part of the sport; you need look no further than the playoffs, when it is an accepted norm to grow facial hair, much to the chagrin of some younger players. Playoff hockey is not only the most important time of the hockey season, but it often seems as if players have mysteriously elevated their play, when logically they should be most weary, following the onslaught of the regular season. The only physical difference between playoff and regular season? Mandatory facial hair. 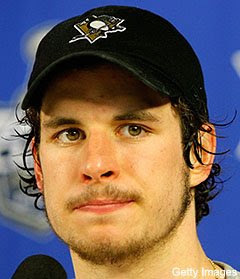 I know that many people find facial hair inconvenient, scratchy, or visually offensive, but what if hockey players kept just a little... on the upper lip perhaps? Those looking for further evidence might examine the case of the Calgary Flames’ Ian White. Drafted by the Leafs in 2002, this fresh-faced youngster played his way to the big team for the 2006-2007 season. In his first season, he put up 26 points and was a +8 on the year, very respectable for a rookie defender on a team that missed the playoffs. The next year however, his numbers dropped, a common effect of the sophomore slump, Ian had only 21 points, while playing 5 more games than the previous year, and was a -9 for the season. By the time the 2008-2009 season rolled around, White was looking to regain his form, and a big change came when White was part of a colon cancer campaign called Movember (more on this later) in which he grew a moustache for charity. White’s game elevated and the moustache never left. The results, another 26 point season and this time a +9 rating on the year on a team that finished 12th in the Eastern Conference. It might be tempting to argue that he was a 24 year-old who was maturing and coming into his own in the NHL. Or you could just get lost in the epic lip growth that propelled him to his best season so far. Fast forward to this season, White is on pace for 37 points and was just traded (with some commoners) for Dion Phaneuf, one of the best defenseman in the game. Not convinced of the importance of the moustache to Ian’s game? Just check out the way it blocks the puck from hitting his face in this game against the Rangers (skip ahead to about the 1 minute mark). Note: White has recently reverted to bare-face, sorry Flames fans. Speaking of Movember, this is a huge charity event each November, where participants (Mo Bros) start clean-shaven and grow moustaches through the month, gathering donations from their friends and families in exchange for being seen with these now extremelygood-looking gentlemen. Quite a few hockey teams have supported this with large groups of Leafs, Oilers, Thrashers and Wild players growing one out for charity. Although these are teams that are perhaps not the best in the standings, it does show an underlying desire of the players to grow moustaches, so there would be little resistance if the muzzy became mandatory (although the creepiness of Olli Jokinen’s stache might have to be banned). For further support of the stache, just look at the NHL legends who have sported a soup strainer during their career, these have been men feared for their reckless and vicious nature. Just look at Eddie “The Entertainer” Shack. He was once ejected from a game for fighting with Larry Zeidel. After his ejection he showered, and then sat in the crowd to watch the end of the game. Apparently Zeidel wanted to watch from the stands too, but Shack was having none of that, and renewed the fight amongst the fans. Another feared enforcer was the pushbroom-sporting Wendel Clark. Wendel was just as feared for the shots from his stick as from his fists. I mean, the man was drafted at the age of 18 with a moustache that made Tom Selleck openly weep! (as this video should make you do as well) Even today, the Ducks George Parros has made a name for himself, based solely on the fact that he is a moustachioed fighter. The man has scored 11 goals in 277 career games but has stayed around the big club, based on 664 career penalty minutes (that’s 132 fights worth, so basically a fight every other game). I mean, how would you like your chances if the man you’re fighting has thicker hair on his lip than Matt Stajan’s head?! Not good. Gary Bettman is constantly explaining (see: whining) that the NHL needs to reach a broader market, and be more appealing to a wider demographic. Well Gary, my suggestion would be to stop trying to put a team in every state that’s never even experienced ice before, let alone hockey, and try my strategy out for size. Mandatory season-long moustaches. I guarantee people will tune in, and if the NHL cross-merchandises with a moustache comb company, their financial woes would be no more. So I say, put down that razor, NHL superstars, and let your lip runneth over. What’s the worst that can happen?! ... Possibly lip-crabs. Here's the Leafs All-Moustache team.